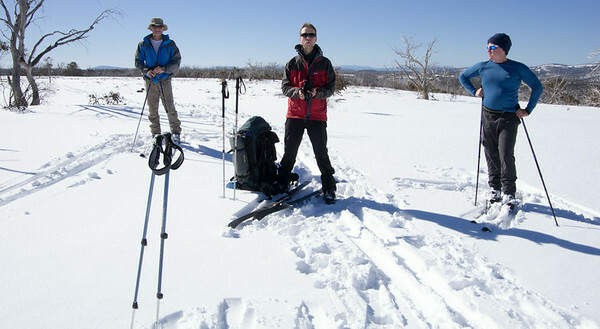 What an epic trip.. nine days back country skiing in the Australian 'Alps'. 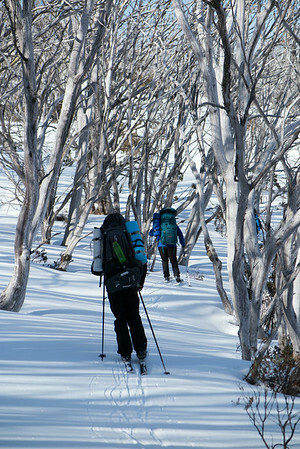 Who'd have thought such a long, remote and rewarding ski trek could be had in our own backyard. 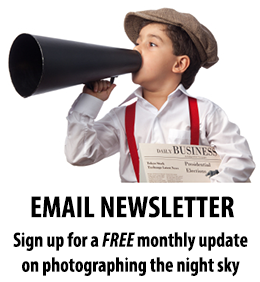 View the full album of photos on SmugMug. 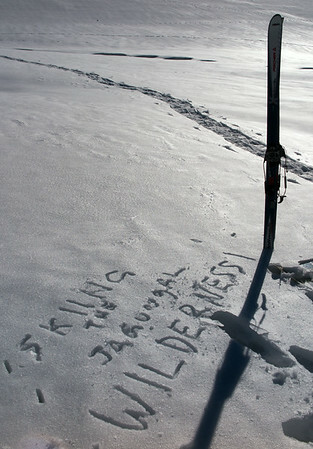 If you're planning your own K2K or back-country ski in the Jagungal Wilderness, read the planning notes. She'd talked about it often enough, so Tim called Tracey-Ann's bluff: "When are we going to do Kiandra to Kosciuszko (K2K)?" Tracey-Ann took the bait and said "We should do it this year", if we could just find four people. Tim, Eric, Tracey-Ann and me made four. 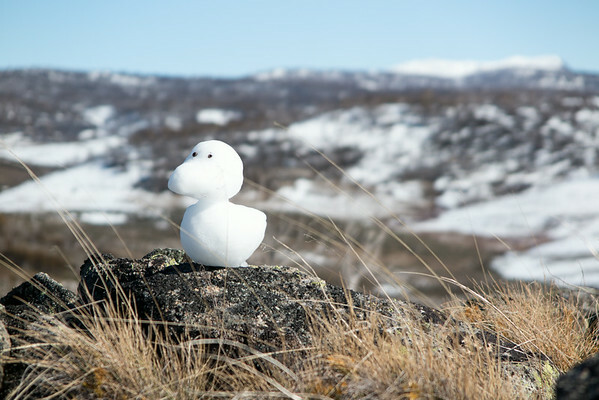 So we booked out two weeks in August hoping for a weather window and then when the snow didn't fall in June we figured it was nothing more than a nice idea. Then the snow did fall, to low levels, and it fell again. Yikes, are we really going to do this? 100km. Nine days food on our backs. 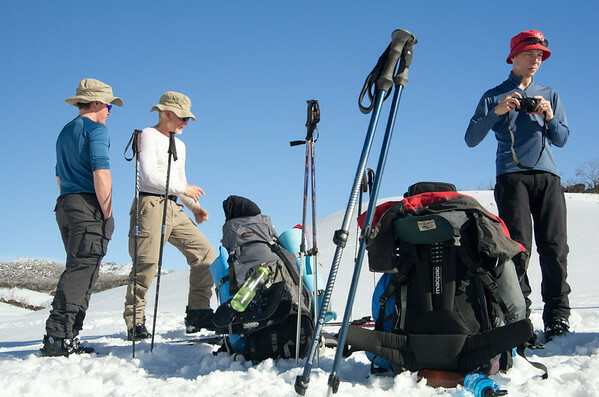 Three days skiing from the nearest help. Let's go! 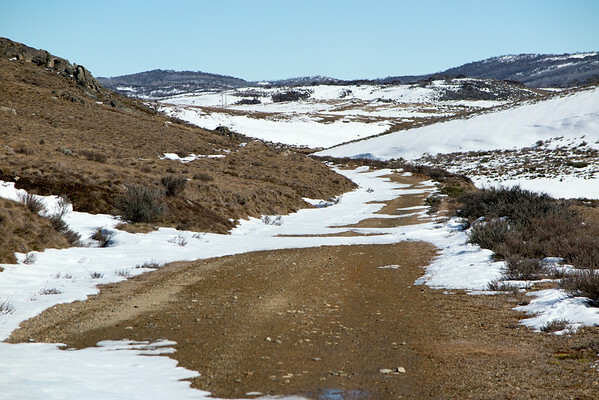 There was no water in our Jindabyne Holiday Park caravan in the morning as the water pipes had frozen. Presumably handling frequent sub-zero temperatures hadn't made the list of approved design criteria. We met John our transport to Kiandra, said goodbye to comfortable shoes and loaded in for the drive to Kiandra where conditions couldn't have been much better. Kiandra. Sun and Snow.. what more could you ask for? Fresh legs didn't make climbing up the path with heavy packs any easier but we made steady if slow progress. Our GPS waypoints hit their mark along the way which was reassuring. 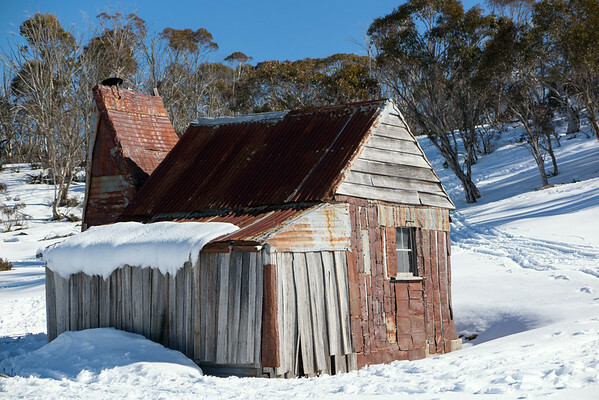 And we enjoyed a quick ski out to Four Mile Hut - they don't come with much more character than this. 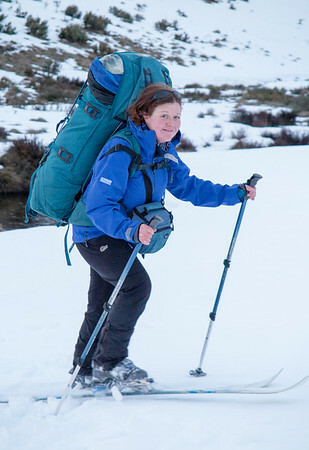 I had complaints about the harness on my pack but certainly not about the weather or the snow on Day 1. We headed off the main trail for a short cut to Broken Dam Hut and were there just in time to catch the beautiful mountain twilight. Couldn't have asked for a better first night. Nine days of food meant that I was more than willing to sacrifice the weight of my DSLR which would normally accompany me in the snow. 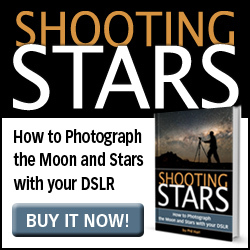 But I was keen to see what my new and slightly lighter Canon G1X Mark II could do and knew that I needed to make the most of the early nights as increasing moonlight later in the week would wash out the night sky. This is one of my favourite photos of the trip and it was worth burning one battery for this and the accompanying 4 seconds of timelapse. 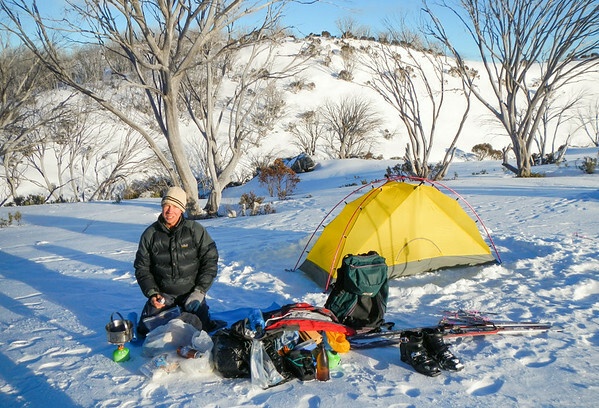 In hindsight, a sleep in and lazy morning faffing around learning how to fit everything in the pack followed by a couple of ski turns and a few photos probably wasn't the start we needed for a day that ended bush bashing in moonlight. 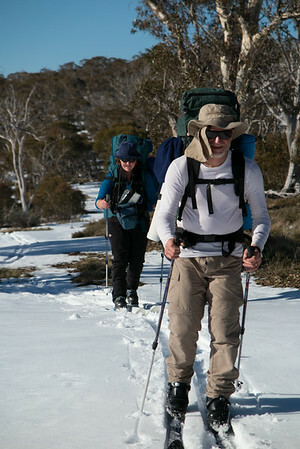 So finding our way back onto the Tabletop Mountain Trail from the hut probably should have happened before 11am. A side trip up Tabletop Mountain was also consistent with our desire to explore the area but still wasn't getting us to our destination any faster. We had a late lunch and still had 80% of the day to go. We reached the Boltons Hill Trail late in the afternoon but we were all feeling well with plenty in the tank and so decided to take the adventurous option down Arsenic Ridge, knowing that it could be challenging but that the Moon and clear skies were there to help us if it turned into a night ski. 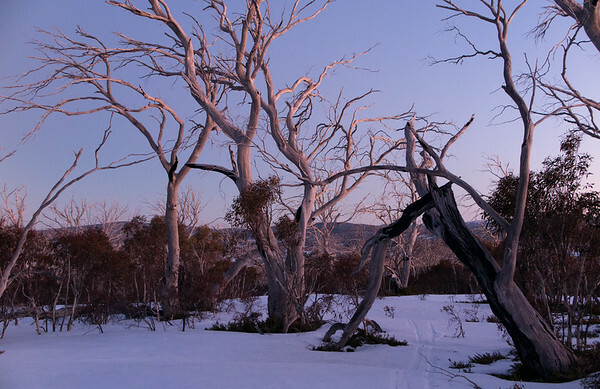 We hit our first way points along the ridge with relative ease, but a short descent and traverse following what initially looked like human tracks from the other direction soon led us into impenetrable snowgum regrowth. 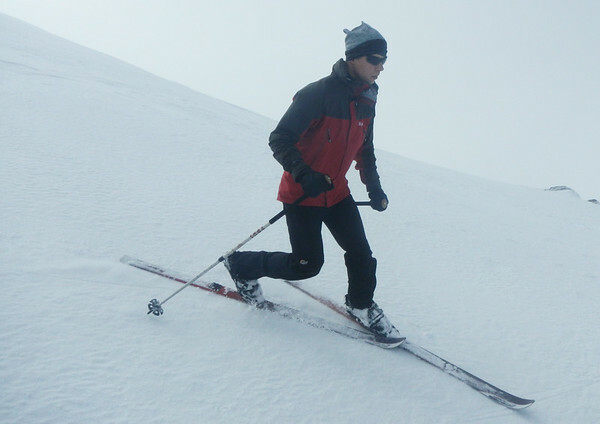 Eventually we managed to track back a little onto the highest parts of the ridge and made better progress, taking our skis off for the steeper and trickier sections. Not being able to see the surroundings particularly well, we did the final 500m to the hut on the shortest path through the bush but daylight would have revealed several much easier options. 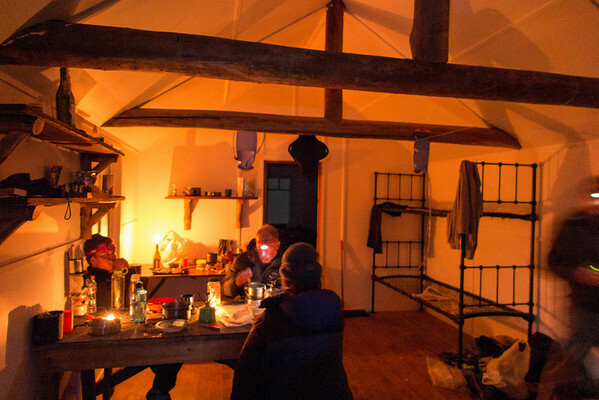 We pushed on through the process of dinner and melting snow for water, in a hut with less ambience than the night before, and laughed at ourselves for thinking we could have reached this spot by midday. After a lovely sunrise over the plains around us, we skied a kilometre from the Hut before ditching the skis and commencing what was half a day of mostly walking. And in our fresh naïveté we carefully planned to reach the infamous log bridge over Happy Jacks Creek, not yet knowing how routine walking through similar streams would soon become. After a quick couple of kilometres along Happy Jacks Rd we headed up a ridge, making a bee-line for higher ground and the Grey Mare Trail. It was a hard haul but a nice lunch spot was waiting for us near the top. 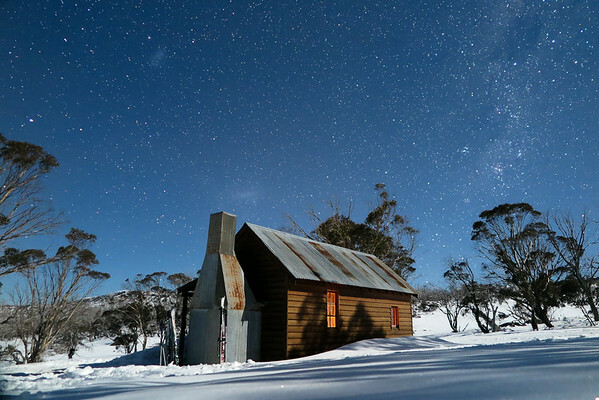 The trailing edge of a cold front was on the way, and the clouds and a cold wind picked up late in the day but Mackays Hut was in reach for a well-earned night's rest. Cold winds and cloud were still with us at sunrise but they gave way quickly to more sunshine and blue skies. But we had to get wet feet twice on our adventures today. Our feet warmed up quick in the sun but the water was still painfully cold while you were in it! The view just before we dropped into Bogong Creek valley before the final climb to O'Keefe's Hut was the best we had seen for the trip and gave us a better sense of heading into mountain terrain. 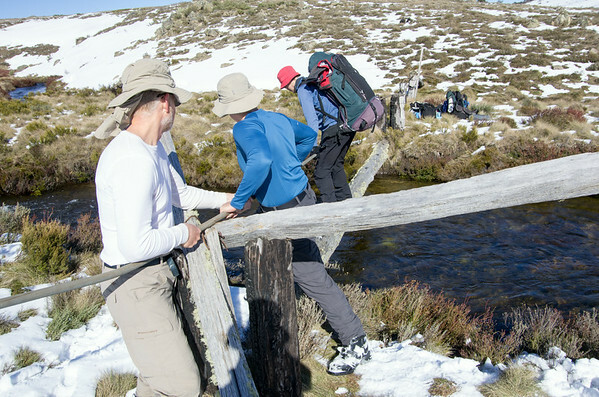 Pity about the wet feet crossing of Bogong Creek. O'Keefe's Hut certainly lived up to its reputation and remains my favourite hut of the trip. 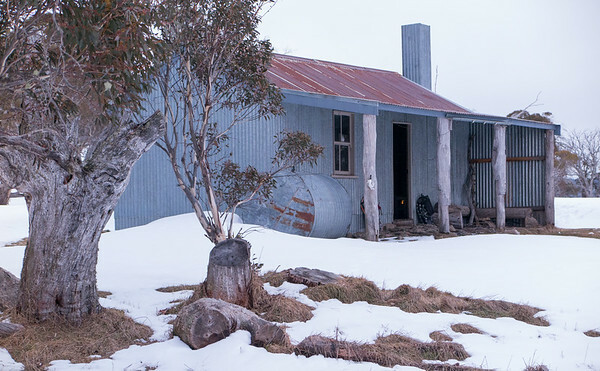 The idea of spending two nights here with a day trip up Jagungal seemed attractive, although we debated several other options that evening before settling back on that plan. 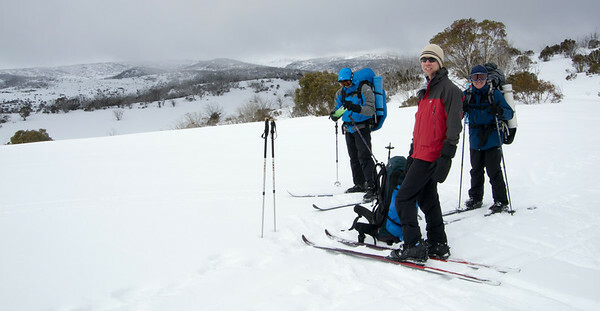 Without doubt the highlight of our trip was our day ski (sans heavy packs!) 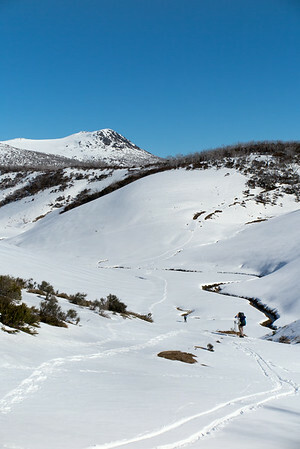 up Mount Jagungal. The mountain was considerably more impressive to climb than I had anticipated and it made for a great sense of adventure. 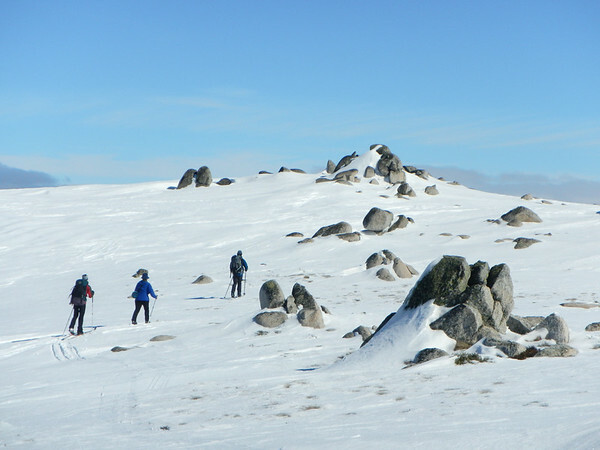 Trying to drop packs and do this as a side trip during a day heading to Mawson's Hut (as had considered) would have been hard work and detracted from the day on the mountain. The day was almost entirely sunny but our view from the top was kept short by some clouds that came in around the peaks, only to disappear not long after we descended. Still, they added plenty of drama and a sense of dramatic mountain summit. I didn't get a lot of turns in, but Eric was good enough to get this shot. We knew we had a big day ahead of us so started early, which only led us straight into a very icy climb and descent from O'Keefe's Hut. At least we had views of Jagungal from different angles to keep us interested. The clouds eventually cleared and the sun and wind softened things up considerably - a much warmer day than previously which although sunny had been cold. We made quicker progress until the stream crossings began. The others had a wet crossing of the Tooma although I managed to hop across stepping stones with my boots on, with lunch the reward shortly after. A climb was rewarded with views of the Main Range in the distance, before we descended down to a crossing of Back Flat Creek before the final slog up to Grey Mare Hut and its somewhat unpleasant leaning tower of a toilet. This was our only bad weather day out of nine days on the snow. 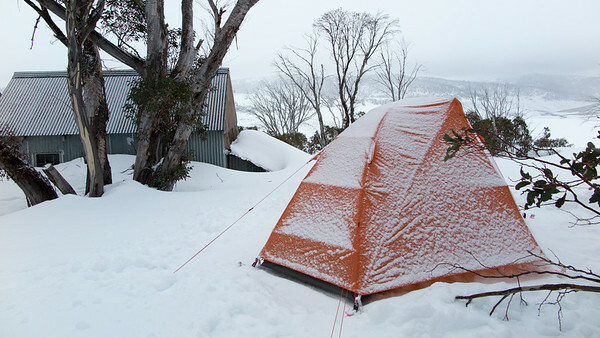 A trough had come through during the night and a cold front followed around 8-9am in the morning dropping just a dusting of snow, enough to christen my new tent. We waited for the wind behind the front to settle in to see how bad the conditions were (and checked the forecast on the hill behind the hut) and decided that we were still up for it. Unfortunately this was also the day with four potential stream crossings (or 'opportunities to fill up your water bottle' as we euphemistically called them). The Geehi was the big one. Two trips shuttling gear across here was enough to reach the pain barrier. And another shot with clouds just to prove it wasn't sunny every day! 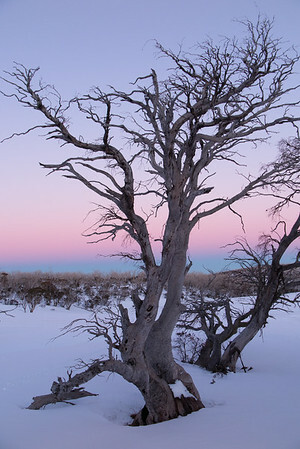 With hope still of taking this epic adventure over the Main Range to finish at Charlotte Pass, we started moderately early after waiting 15 minutes after the alarm for the sun to push things above -12 degrees before trying to pack up camp. 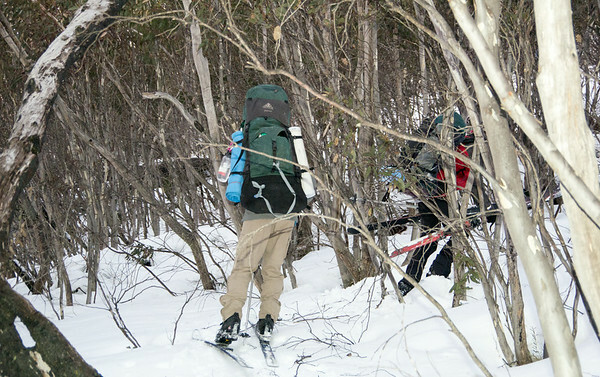 We made good pace traversing through the trees on lovely snow (some distance off the actual trail), up Duck Creek valley to our first break at a saddle in the sun but heading near some trees for shelter from an icy wind. 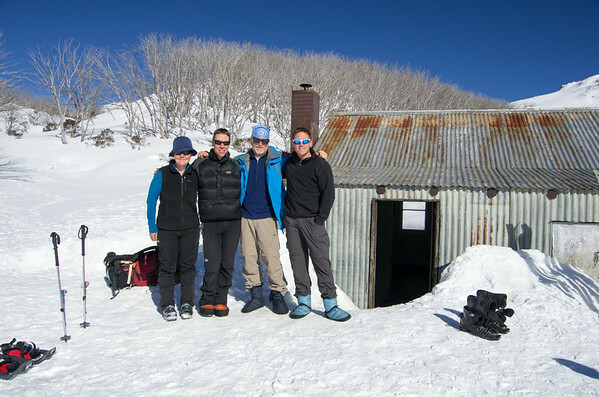 We pushed on to Schlink Hut for lunch on schedule and a little further up the road before Eric conceded defeat with the injury to his shoulder sustained on the Jagungal day. 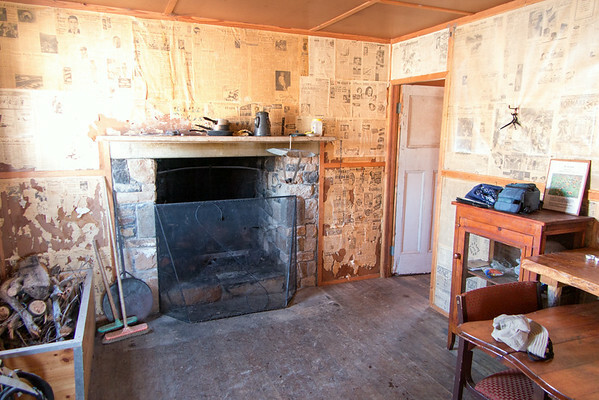 So we made some phone calls to arrange transport from Guthega for the following day, found out about the two point win for Geelong over Fremantle for Tim and Eric (who'd rarely waited so long to catch up on a result) and then headed down to White's River Hut. Although the cloud base was above the mountain tops, the icy wind would not have been at all pleasant if we had made it up to the Rolling Grounds or Consett-Stephen Pass for the night. We had stretched our food and could have delayed that move till Day 9 but Tracey-Ann was still carrying her cold and the accumulated pain of a week with heavy packs was stretching us all. 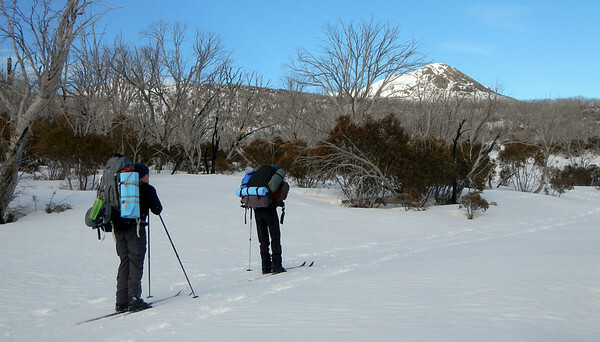 So we conceded that we had done enough and had a relaxed evening at White's River with company from others who had skied/snowshoed in from Guthega. We'd just experienced -13 degrees at Valentine's Hut, as well as -12 earlier in the trip so cold temperatures were no great surprise. 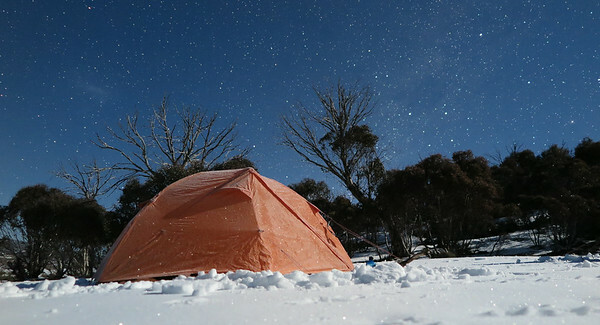 But this last night was clearly the coldest of the lot - I measured -15 degrees while even Perisher Valley measured -11. I was sleeping in the same gear I slept in during my aurora adventures in the Yukon and used the down jacket wrapped half around me in the sleeping bag to stay warm and comfortable. I thought about putting my down boots on as well but got back to sleep easily before that internal debate went very far. We had a slow morning before a quick and easy descent down the road from White's River Hut, which disguised a few more ascents than I expected. But we were in good form and did them easily. 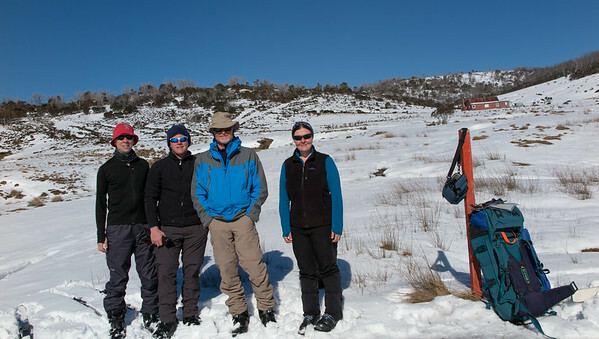 Skis were removed to walk over two concrete culverts over streams but otherwise we had good skiable snow to within 100m of Guthega Power Station which was a very pleasant surprise. Unfortunately I forgot a lesson I had already learnt.. when the snow cover starts to thin small rocks slow you down real quick. 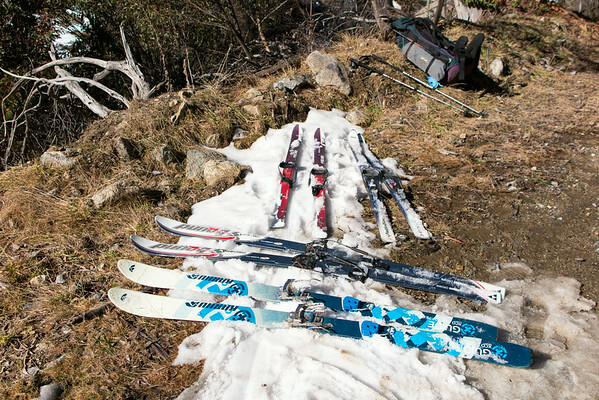 I wasn't going what you would call fast, but when my right ski hit something slow my pack kept going and I ploughed head first into the snow, but not without reaching out with my right arm and injuring my shoulder as a result. A very unfortunate and somewhat silly way to finish the tour.